Welcome Day is an opportunity for new students to get to know each other and their campus as they begin their academic journey at MCCN. Convocation is an annual event that brings together faculty, staff and students to celebrate the official start of the academic year. Sponsored by the Mount Carmel Foundation, the Golf Invitational benefits Mount Carmel College of Nursing student scholarships. The Office of Student Life sponsors a picnic to welcome students to the new academic year. The annual dinner allows scholarship recipients to personally thank the donors who support their life’s calling of becoming a professional registered nurse. The Excellence in Nursing Awards Ceremony is a Mount Carmel Health and Mount Carmel College of Nursing-sponsored event to celebrate nurses, nurse leaders, providers and College of Nursing faculty. The awards honor outstanding professionals for their dedication to quality care and service. The Office of Student Life sponsors a Fall Wellness Festival for students to promote health and well-being of students. These events include a healthy lunch, Reiki and other holistic health services, therapy animals – and more! A Girl’s Life is designed just for girls and their moms to explore issues related to puberty and adolescence. Sophomore Pinning symbolizes the transition from academic to clinical studies, when students first experience caring for “real” patients. Sophomore year is a significant step in the journey to the nursing profession. The Second Degree Accelerated Program (SDAP) is designed for students who have already earned at least a bachelor’s degree in another major to pursue a career in nursing. This is a 13-month program where students earn a Bachelor of Science in Nursing (BSN) degree. The Office of Student life sponsors a Mardi Gras party where students celebrate and enjoy Cajun-inspired food while creating Mardi Gras masks. Explore Nursing Day, sponsored by MCCN, offers high school sophomores and juniors interested in nursing, a dynamic hands-on and educational experience focusing on nursing, nursing education, careers and college readiness. Students will be selected to attend by their teachers and/or guidance counselors. 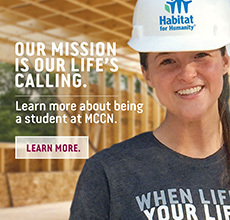 For more information, please contact the Office of Admissions at admissions@mccn.edu or 614.234.5800. The Office of Student Life sponsors a Spring Wellness Festival for students to promote health and well-being of students. These events include a healthy lunch, Reiki and other holistic health services, therapy animals – and more! Graduate students are presented their hoods at this ceremony following a homily and blessing. The students also receive awards from their professors. Undergraduate students from the traditional undergraduate, SDAP and Online RN-BSN program are pinned at this ceremony. The traditional undergraduate students receive awards from their professors. Students from all programs – traditional undergraduate, SDAP, Online RN-BSN Completion Program and graduate are presented their diplomas.